If you are looking for a postcard image of Provence, that of authentic Provençal atmosphere, then look no further than the Alpilles mountain range! 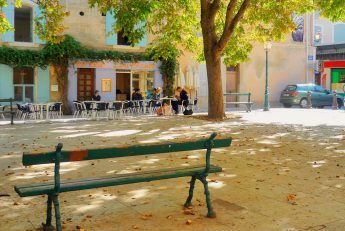 The region boasts some of Provence’s most famous tourist sites, such as the fantastic Roman ruins of Glanum, the medieval village of Les Baux-de-Provence, the stylish and refined little town of Saint-Rémy-de-Provence, surrounded by a colourful and sun-kissed landscape of cypress trees, olive groves and sunflowers. What are the Alpilles mountain range? The Alpilles are a small, craggy and rocky mountain range in Provence which stretches from the Rhône River to the Durance River, 20km South of Avignon. The peaks of this extension of the Luberon mountain range are predominately made up of bare limestone rock and scrub. The lower slopes boast cultivated land, rich in olive groves and vines and, on the foothills, pine, almond and Kermes oak trees. The Alpilles are not a high mountain range; the highest point reaches to an altitude of only 498 metres at Les Opies. In fact, its seemingly mountainous appearance is more a result of its position, towering over the rest of the verdant but extremely flat Crau plain. between 8 and 10 kilometres wide. The chain runs in an east-west direction between the Rhône and the Durance rivers. The highest points of the range are listed as a nature reserve where a number of rare species live, some of which were introduced in the 1980’s, including Bonelli’s eagles, Egyptian vultures and eagle owls. 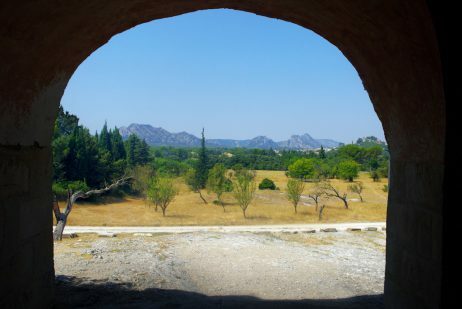 The Alpilles are also the home of various celebrated artists: French authors Frédéric Mistral and Alphonse Daudet. Painter Van Gogh contributed to the fame of the Alpilles through his paintings depicting the mountain. 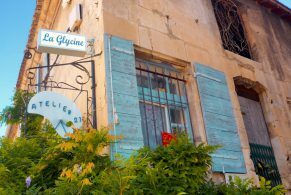 Where to stay in the Alpilles? There is a great diversity of accommodation in the Alpilles, from luxurious hotels to guest houses. Click on this affiliate link from Booking.com for a comprehensive list. Several typical Provencal villages encircle the foothills of the Alpilles range: Maussane, Mouries, Fontvieille, Eygalières, Le Paradou, and Maillane (Mistral’s village). With little stone houses clustered together around the Romanesque church, quaint fountains here and there, and the open squares shaded by trees and bordered by charming cafés, the postcard-like scenery of the Provençal village is a delight to the visitor’s eye. Seasonal traditional festivals bring intense activity to the little towns and villages, much to the joy – or disappointment – of the tourist! One of the most spectacular events is the Transhumance in Saint-Rémy-de-Provence. In addition, the Christmas season is another opportunity for joyous traditions, including the ‘big supper’ (which involves 13 desserts!) and the “pastrage” ceremony, for which sheep and shepherds are invited to church. Other isolated farmhouses (les Mas) can be found outside the villages, along with old quarries, aqueducts, abbeys and ruined castles, revealing thousands of years of human occupation. While driving or hiking in the Alpilles, you will most certainly see many remarkable panoramic views. Two worth mentioning are the panoramas from a summit near Les Baux-de-Provence and from La Caume. 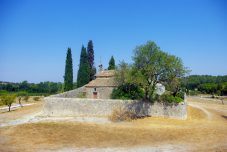 The former is located between Saint-Rémy-de-Provence and Les Baux-de-Provence, along the D27 road. A little road to the left leads you to the summit. There an orientation board will help you locate and identify the region’s landmarks: the Camargue, the city of Arles, the Crau plain, the Luberon, Mount Ventoux, the Cévennes and the Rhône Valley. The exceptional view over the village of Les Baux helps us to truly understand the uniqueness of the site as a whole. The second panoramic view is that of La Caume. At 387 metres high, it is easily spotted by the television relay station. The view stretches over the Alpilles range, the Crau plain, the Camargue and, to the north, the Rhône valley, the Durance valley and the Mount Ventoux. However, be advised that the summit might be closed to the public during July and August in order to prevent bushfires. From 1st July to 9th September, access to the woods of the Alpilles is forbidden in order to reduce the risk of bushfires. The same conditions apply at any time of the year when the Mistral wind is blowing at over 40km/h. 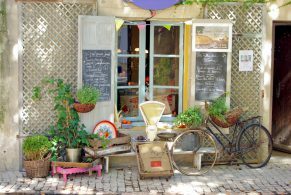 Les Baux-de-Provence: a touristic hotspot! Situated 15 km from Arles and 25 km from Avignon, the small village of Les Baux-de-Provence and the ruins of its medieval castle are the stars of the Alpilles. Set atop a rocky spur, it displays panoramic views over the Crau plain, the Camargue and the city of Arles. Listed as one of the most beautiful villages of France, Les Baux-de-Provence attracts 1.5 million tourists a year, while it has a permanent population of only 400! Many of the houses still make for fascinating ruins which evoke the conditions of medieval times when the village’s population was as many as 4,000. The little town of Fontvieille (3,500 inhabitants) lies to the south-west of the Alpilles range. The village is famous for its windmills. Particularly one of them: the “Moulin d’Alphonse Daudet”. The mill is also known locally as the “Moulin Saint-Pierre”. Set on top of a hillock, the windmill dates back to 1814 and is associated with the memory of French (or, more specifically, Provençal) writer, Alphonse Daudet (1840-1897). A small museum next to Daudet’s mill is dedicated to the writer. From the windmill, the view is truly remarkable and stretches from the Alpilles to Beaucaire, Tarascon and the Rhone Valley. One kilometre away lies the château Montauban, where Daudet lived his last years. The 18th century castle was the residence of the Ambroy family. The building now housed an exhibition on Fontvieille’s traditions. The ground floor is dedicated to Alphonse Daudet and illustrator Léo Lelée (1872-1947). There is also a room displaying a Provençal nativity (crèche provençale). 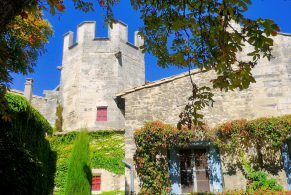 Located on the eastern side of the Alpilles and surrounded by olive groves and vineyards is Eygalières. The typical Provençal village is perched on a small hill. It features winding, colourful and narrow streets which lead up to the keep of the ruined castle. 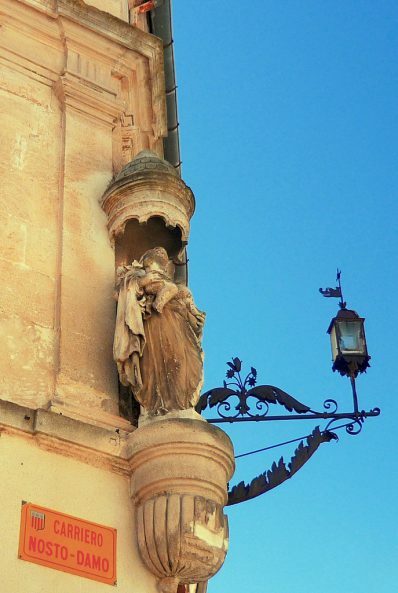 The Romans called it “Aquileria”, as they used its spring to supply the town of Arles. One of the most beautiful villages of France, it owes its appeal to a combination of a very agreeable lifestyle, good restaurants, food and wines. It is no surprise that many French celebrities have bought holiday homes here! Walking towards the summit of the hill will take you up to the church, the ruins of the castle and the esplanade of the old gatehouse. The view from the top of the village, over the Durance Valley and the Caume mountains, is breathtaking. Just outside the village of Eygalières sits the Romanesque Saint-Sixte chapel, which has been listed as an historic monument by the French government since 1971. The chapel dates back to the 12th century and stands, isolated, on top of a rocky mount. The edifice is supported by massive buttresses and topped by a bell-tower wall. The chapel is dedicated to the martyred Pope Saint Sixte who was believed to have died in the 3rd century. A procession is organised each year on the Tuesday following Easter, during which Guardians from Camargue, riding white horses, and men and women dressed in Arles-style costumes carry an effigy of the Pope to the chapel Saint Sixte. 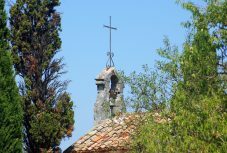 Surrounded by beautiful cypresses, the simplistic chapel is typically Provençal and is certainly a sight to be enjoyed by all, particularly photographers. 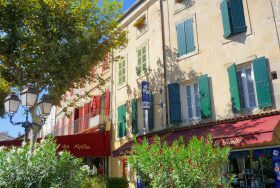 On the northern side of the Alpilles lies the delightfully compacted little town of Saint-Rémy-de-Provence. This Provençal place is surrounded by lush green fields which are bordered by sturdy cypresses and poplars. In town, busy and shaded boulevards enclose the old quarter of Saint-Rémy, which is about half a kilometre in diameter. 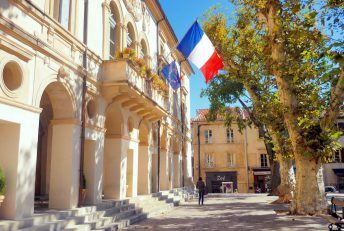 The streets of Saint-Rémy’s old-town are lined with medieval restored houses and lead you to quiet little squares, shaded by remarkable plane trees. Old fountains at the crossroad of two alleyways, cobbled narrow streets lined with aged buildings, boutiques and Provençal-style restaurants will undoubtedly charm you. 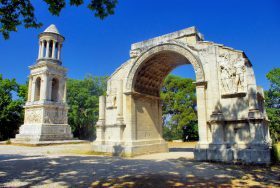 The Alpilles are easily accessible by car from Provence’s main cities Marseille, Arles, and Avignon, as well as from the cities of Nîmes and Montpellier through an excellent network of motorways, the French “autoroutes”. If you travel from Australia or America, you could take a flight to Paris Charles de Gaulle, and travel by TGV from the airport station straight to Avignon or Aix-en-Provence and rent a car from there. The TGV from Paris-Gare de Lyon takes less than 3 hours to the TGV stations of Avignon and Aix-en-Provence. There are no train stations in Saint-Rémy-de-Provence or Les Baux-de-Provence. You’ll have to take a coach from Avignon or Arles to reach the region. More info about the Alpilles!